In the previous article, we ended up with a workspace that was configured for Java but with some missing dependencies. An extra step is usually necessary: indicate that you’re dealing with a Maven project. This has to be done only once by the user that set up the workspace. For that, go to Project > Update Project Configuration and enable Maven under the JAVA section. Once that is done, an additional External Libraries item appears in your project tree. You can now open Java files and play around with code navigation, Java completion, and so on. You should now be able to launch your first build command. Open the Commands Palette using Run > Commands Palette or the Shift+F10 shortcut. You’ll see the build command was defined when you created the workspace and you may double-click it to run it. After a few seconds, you’ll see the successful build in the build command’s dedicated console. Nice! You can now start modifying code and do some refactoring. 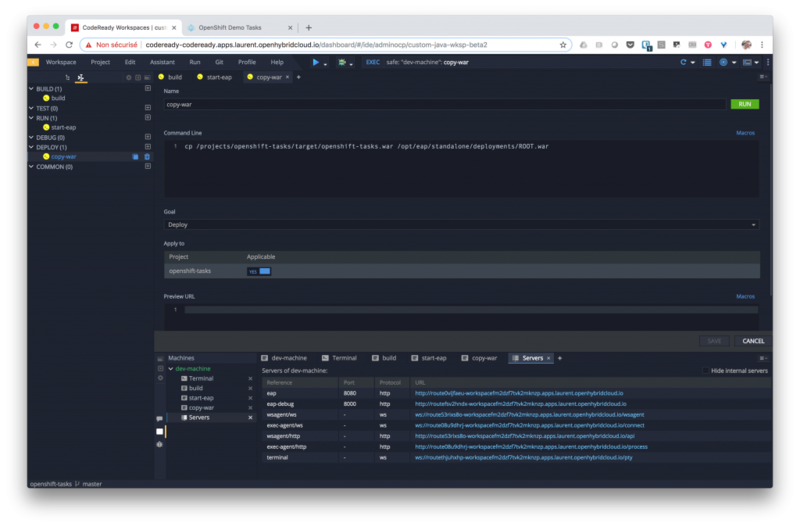 We’re able to edit code, compile it, and package it, but let’s see how to test it locally within our JBoss EAP instance. You can now launch this command through the Command Palette or through the Run blue arrow on the menu bar. The command is executed in its own console and you should see output like the following indicating that your JBoss EAP 7.1 instance is up and running. Now let’s deploy our application to the running instance. For that, let’s create a new command within the DEPLOY section and call it copy-war. Add the command below and execute it. This enables the previously built WAR archive to be deployed to our JBoss EAP instance’s deployments folder. The instance should now hot-deploy it in a few seconds. You may now want to check your application and play with it. Just right of the command console, click the + button and choose Servers. This will open a new view displaying the URL corresponding to the different servers attached to your workspaces. Remember the eap server we declared in the stack configuration? 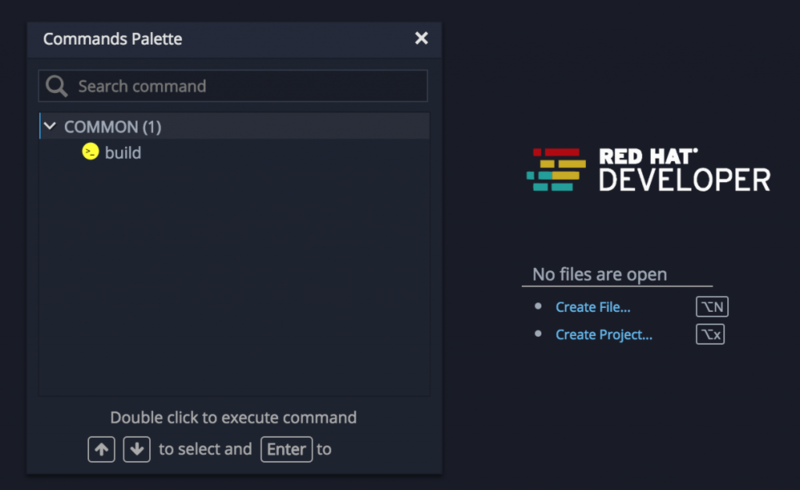 This information is used by Red Hat CodeReady Workspaces to create a new OpenShift route that allows you to access your deployed application! Just copy and paste the URL into your browser and you should see our test application live. Now start the JBoss EAP instance using the debug mode. Before starting it up again, you may want to stop the running instance: you can achieve that by looking for the start-eap running process in the top EXEC menu bar and clicking the blue square. Your instance is now launched in debug mode and you have to launch a debug session within the IDE. 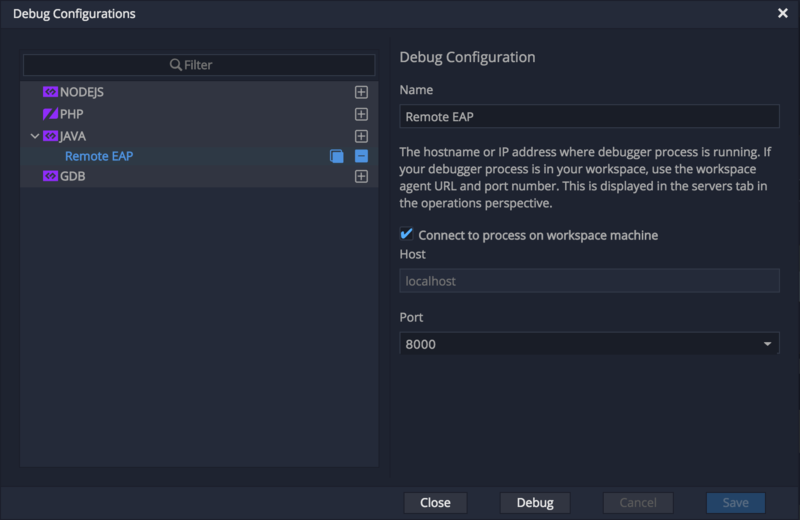 Before doing so, remember that the Edit Debug Configurations item in the Run menu lets you configure a connection to a remote JBoss EAP instance using port 8000, as shown below. You can now start a debug session through the Run > Debug > Remote EAP menu item. The IDE connects to localhost:8000 and switches to the debug perspective. You can now open some Java class like /src/main/com/openshift/service/DemoResource.java file. Click on line 44 to place a breakpoint. 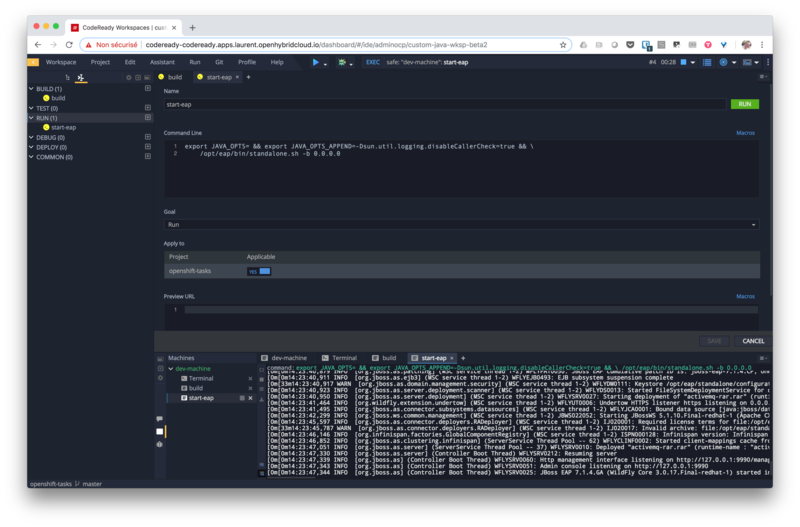 Now go to the browser tab hosting your app and click the Log Info button; you should see the debug session starting in the workspace and filling up the Frames and Variables panels. Setting up everything was not that hard but it takes a little time and can be error-prone. 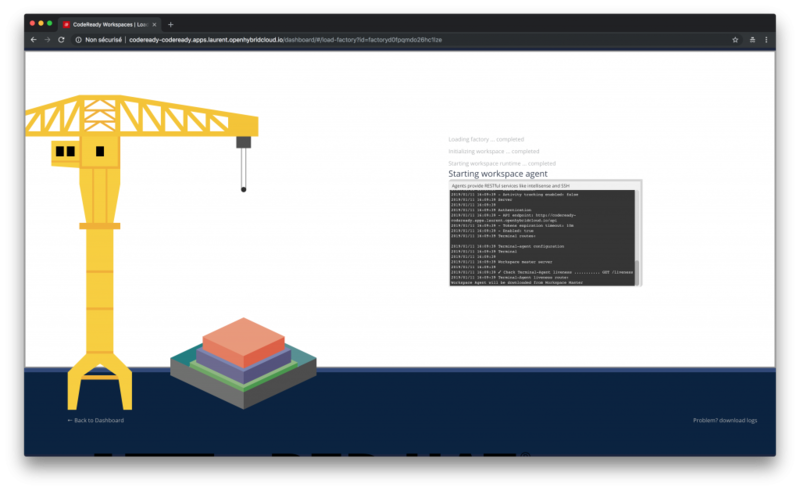 Red Hat CodeReady Workspaces offers the concept of a factory in order to be able to reproduce and duplicate a workspace configuration. Using factories, you can easily onboard new collaborators for your project by making everything available with a single click! 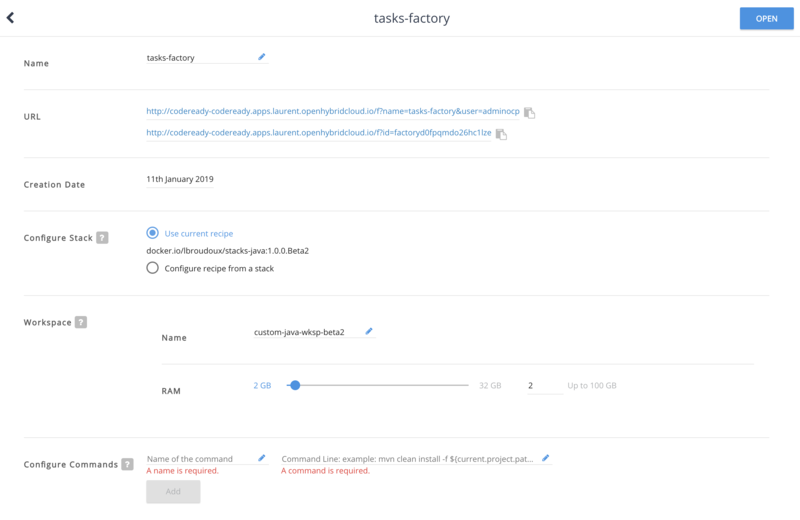 The most important attributes of a factory are its URLs, which can be used for launching a new workspace embedding all the configuration and commands we added to the original workspace. A URL may be combined with nice badges to offer instant access for any README or wiki page. Just copy and paste one of the URLs into a browser tab or click a badge and you’ll see this nice crane animation building your own workspace on demand, allowing you to quickly starting collaboration on a new project. 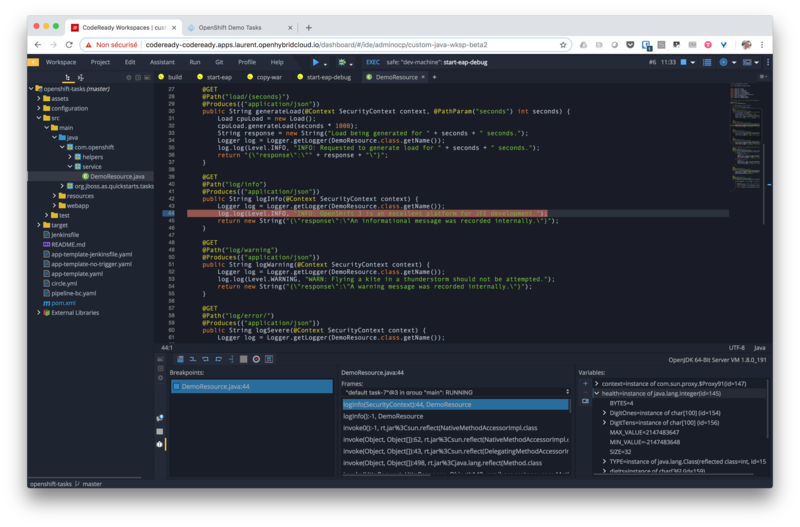 Now that your collaborator’s workspace is up and running, she can start coding and easily contributing pull requests to your original source code repository. But I’ll leave that topic for a later article. We have seen through this tour how Red Hat CodeReady Workspaces allow you to configure a development environment and easily replicate and distribute it among your organization. 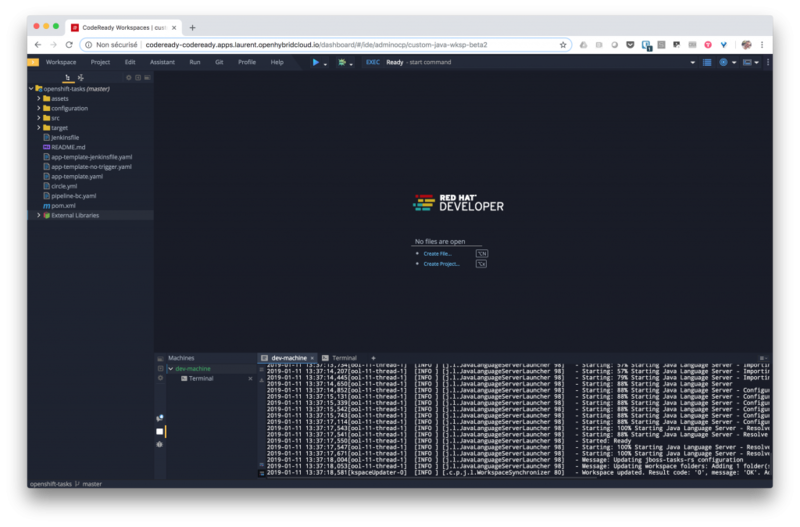 The embedded cloud/browser-based IDE provides everything you need to start quickly collaborating on projects while providing you security through centralization of source code and authentication of access. Red Hat CodeReady Workspaces gives you greater security and faster onboarding, and it ensures your code works on all your developers’ machines too. Best of all, it’s easy to sign up for the beta. Visit the product page to get the code and everything you need to know about the product. Learn how to create resilience in your application as you connect, manage, and secure microservices. Istio Service Mesh for Microservices, by Christian Posta and Burr Sutter, is one of the many free books available to our Red Hat Developer program members.